This Chicken Pasta Bake recipe is the one dish I’m most famous for. It has a fabulous filling and is a hearty meal for cold winter nights! 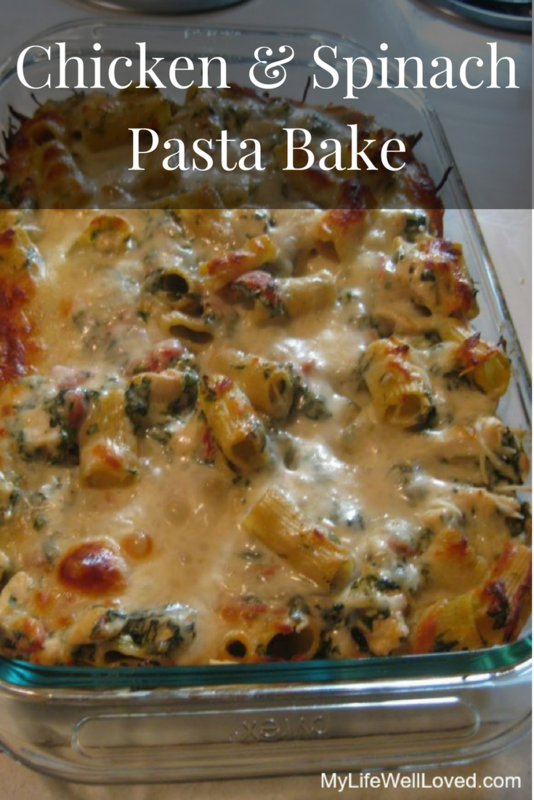 The thick, melted cheese, savory noodles and spinach marry together to make a beautiful meal. 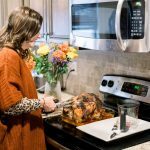 Not only does this recipe look pretty in a casserole dish for serving, but it makes your whole house smell warm and inviting. This recipe is also great to take to new moms or someone who is sick and needs some cheering up. I must tell you, this is one of my favorite dishes to make when we are having company over.I love to serve this at a dinner party because it has a nice presentation, is filling and usually there are leftovers to enjoy. You can cook & chop the chicken as well as cutting up several other ingredients in advance plus it has beautiful presentation. Added bonus: I frequently get asked for the recipe. It’s tried & true and from the kitchen of my friend, Jessica’s mom. She found it in a Southern Living magazine back in 2007. 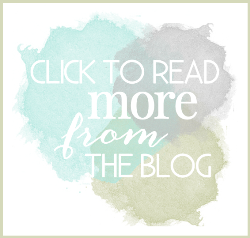 If you love Pinterest, you can follow my boards here; I would love to share with you all my favorite things! I’m proud to say this Chicken Pasta Bake recipe has been pinned well over a MILLION times. Talk about popular! 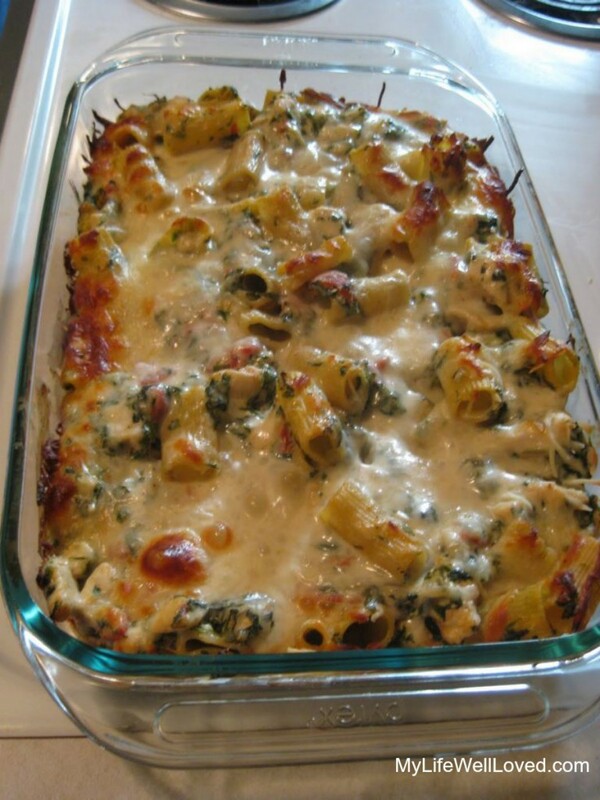 Hope you all enjoy this Spinach & Chicken Pasta Bake dish, too! This recipe is my go to for bringing to friends and family when they need a good casserole. Last time I made it, I substituted the noodles for whole wheat and I’ve even omitted the onion for nursing mommies. You really can’t go wrong with this recipe! Need a cute kitchen themed gift to go with your dish? 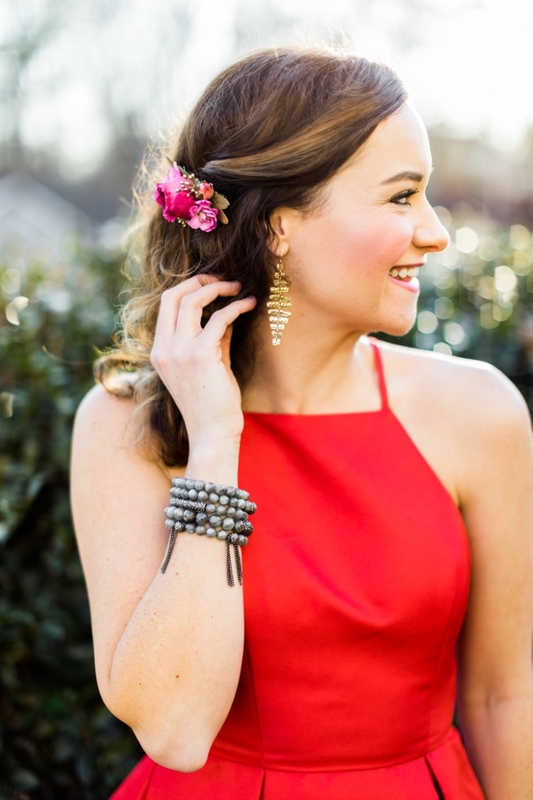 Check out these pretties below! Love this chicken pasta bake recipe? Please pin it or share on Facebook! Spread oil on bottom of 11×7 in baking dish; add onion in a single layer. Bake at 375 for 15 minutes or just until tender. Transfer onion to large bowl, set aside. Drain chopped spinach well, pressing between paper towels. Stir in rigatoni, spinach, chicken, & next 4 ingredients into onion in bowl. Spoon mixture into dish & sprinkle evenly with shredded mozzarella cheese. Uncover & bake 15 more minutes or until bubbly. Want more of my most popular recipes? 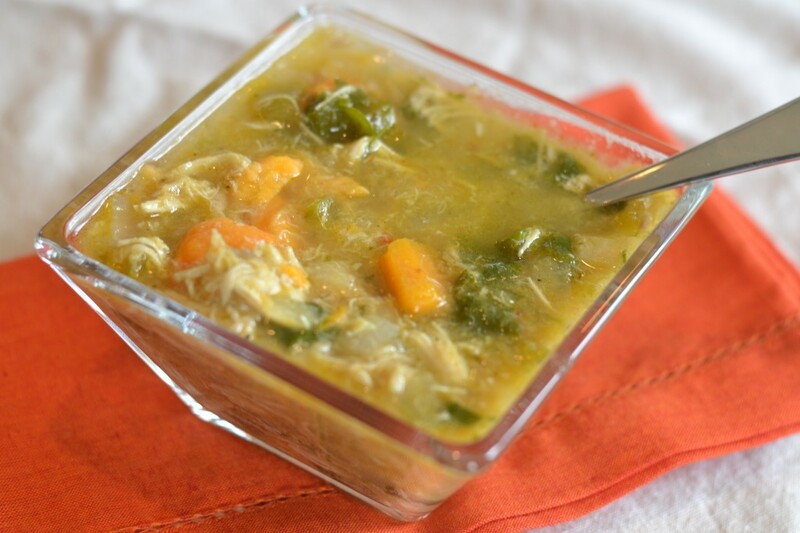 How about this Paleo White Chicken Chili orLemon Cream Cheese Cupcakes? 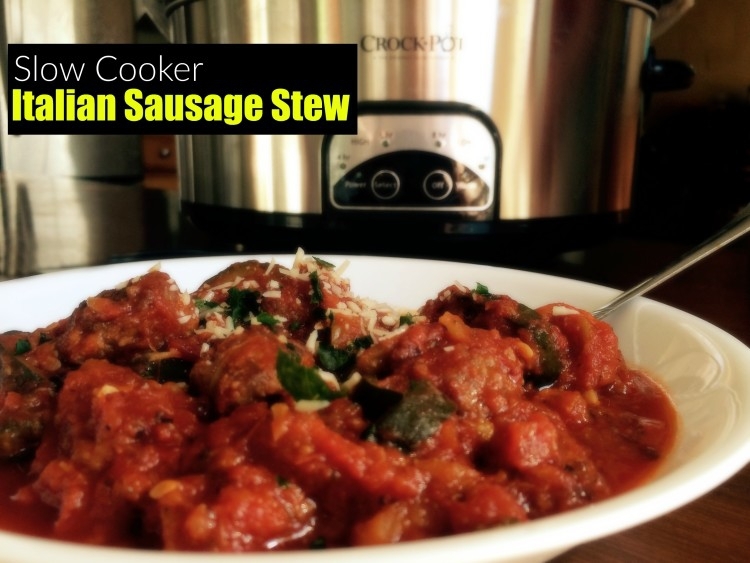 I also love to bring this Slow Cooker Sausage Stew to a new mom, and I have a post dedicated to The Best Freezer Meal for a New Mom. Mine came out a little dry…I think maybe next time I will use 16oz of cream cheese…maybe that will help? It was still good though. How fun, Charis. Thanks for sharing it for your readers with a link back. 🙂 Super glad to hear you enjoyed it! does this recipe freeze well? would love to make this ahead and freeze some..
I’d LOVE to have you report back to me and let me know how it does for you! I didn’t freeze mine. Sorry I can’t help you there. Hi! I am curious, will the Chicken & Spinach Pasta Bake recipe change a lot if I were to use fresh spinach instead of frozen? I was wondering the samething. I have not tried the recipe, but I would like to use fresh spinach instead of frozen. HI Monica, I’ve had others tell me they’ve used fresh and it’s worked great. If you do, please let me know how much you use and if you like it. Thanks so much! I used fresh spinach rather than frozen spinach. I probably used about five ounces of it and chopped it up. I didn’t use as much as the recipe called for because I wasn’t sure how the guys I cook for would like it. However, this dish turned out fantastic and it has definitely made it’s way into our usual meal plans. I use fresh spinach every time! I was given this dish when I had my “baby” seven years ago and it’s my go to for food delivery for families in my Village! I’m making one right now for a friend who had a stroke. I always add more cream cheese and an additional can of tomatoes. Next time I think I’ll add mushrooms because I saw that in a similar recipe a few minutes ago. I felt like I was forgetting something but nope!! It’s just that easy!!! Crowd pleaser!!!! I made with Alfredo sauce sans cream cheese cause I didn’t have it in my fridge. It was very yummy!! Yes but make sure to cook it a bit before, raw spinach contains a lot of water and it will dilute the other wet ingredients. I have ruined veggie lasagna this way! Great tip, Paula! Thank you! This is a great sounding combination! Absolutely! Hope you enjoy it, Rebecca. Pingback: Blogger of the Week #19 - Who Needs A Cape? This was pinned over a million times. HOLY COW! That is amazing! Isn’t that wild?! Can’t get over it. So glad people love it so much! Fun to find you on the SITS Girls FB Group! This is too funny- I am one of the million who have already pinned your recipe! Love your site! Super fun! YAY!!!!! How cool. Thanks for telling me, Amy! Hi this looks scrummy. But could you please tell me how many people more or less this feeds? Am cooking for 50 plus and need to calculate. Thanks. What would be the reheat instructions if frozen? I’m making this for a set of new parents. Would love to hear when you try it, Holly! I have never re-heated it myself so please come back and leave a comment to let us know! I have made this several times. Delish! Can anyone tell me the calorie count??! I’ve thrown away all of my ingredient packaging. I have made this countless times, but today I have loads of ground beef, so I am trying that instead of chicken. Also, I just use regular cream cheese and add in some spices (onion powder and dried chives) – less expensive, and more likely to have it on hand than the specialized stuff. Great idea, Jan! How’d the ground beef version turn out? I have made this several times…it is a staple in my repertoire now. My husband absolutely LOVES this dish. I made it for my family, which that night included my step-son, and while he turned his nose up at the Spinach part, he quickly ate the first serving and went back for seconds. I have made this for other family members that simply love it as well. 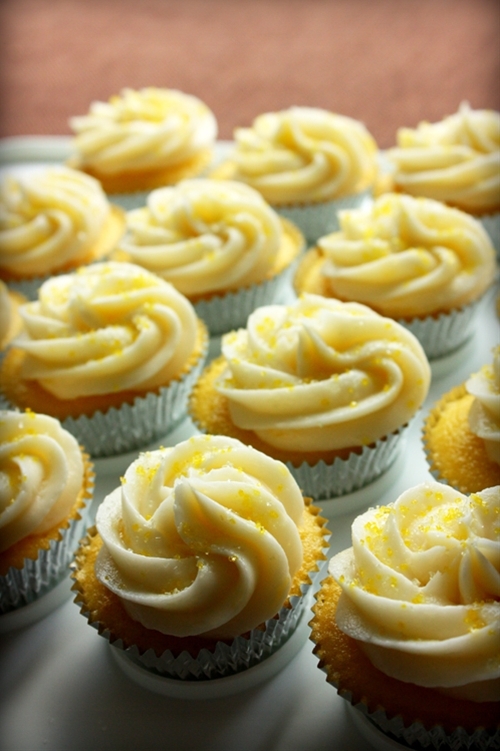 Thank you for sharing this now favorite recipe! I love this dish! I made it for my fiance about a week ago and again for my daughter who’s visiting today. It’s wonderful and loved by all! Thanks for the great recipe. It also tastes great the day after as leftovers! This makes me so happy, Jeanne, thanks so much for sharing! 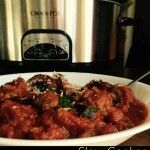 Pingback: My Menu for August (Trying out new Recipes) | Sew Mommy, What's for Dinner? I have a question about the onions. Do you bake the onions in the oven for 15 minutes? OK. Thanks. I’m making this tonight, even though it’s 98 degrees out. Haha! Just looked so good. Will ley you know how it turns out. OK, would love to hear what you though! It’s still in the upper 80’s here in October, yuck! Made this for dinner with my girls & it turned out absolutely delicious!! It’s easy & quick!! Woohoo, love the hear that Tiffany! Way to get your kids involved too; what a great activity and fun learning experience for them. Love this! I did make a few changes for a larger amount. Used a whole box of rigatoni, 2 bags (8oz) of fresh spinach, 2 cans diced tomatos and 16oz cream cheese. I also sauteed the onions and spinach together instead of putting the onions in the oven first and cooked the chicken in a balsamic marinade. Made a delicious Sunday dinner! Still got the prep done in under an hour. A great way to use spinach! I sauteed the onions and spinach together and added some garlic. After reading some of the reviews, I added a small can of tomato sauce. Tasty and wonderful consistency! My hubby wants me to make it again soon! Great idea, Marian! Glad you enjoyed it. Tried this recipe and didn’t think it had much flavor. If I make it again I will add artichokes and additional seasonings. It wasn’t as creamy or cheesy as I thought it would be. 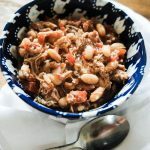 Found this recipe tonight while looking for something for dinner to use up some shredded chicken….and as I was making it, I realized I make a recipe just like this only instead of chicken, I use Italian sausage…. It’s almost identical! The other recipe always turns out delicious and is one of our favorites, so I’m thinking this will be just as yummy!! I’m wondering about swapping out the onion and chive cream cheese for a herb and garlic cream cheese…has anyone tried this? I made this for supper tonight and it was a huge hit. I decided to make it for a frozen meal swap and I was thinking about freezing it unbaked and then people could throw it in the oven for a bit longer right from the freezer. I wonder, though, how long to cook it from frozen? Maybe add 15-20 mins to the cooking time? Suggestions? Heather, I’ve had this recipe on my “make” list for too long, and finally got around to it tonight. It was excellent! I never would have thought to use the chive and onion cream cheese. It was the perfect comfort food for a snowy night. Heather, I made this tonight with a few minor change to use what I had in house! Lol. I sautéed the onion in a pan on top of stove, added everything to that pan including fresh spinach and I used a can of stew tomatoes and added a 1/4 cup roasted green Chilis! A nice little bite to it! After adding cheese I added 1/2 cup of diced can tomatoes over top so plenty moist! Very yummy and great for pot lucks we have often here in Florida! Made this last night, only I sautéd the onions with fresh garlic & mushrooms, & used 2 tons of cream cheese. During my husband’s 2nd helping, I asked him if he thought this was a keeper & he said yes! I loved it too! Oops, I meant 2 “tubs”, not tons!!! BTW: Instead of plain old salt & pepper, I used creole seasoning!!! I just made this with a couple of handfuls of fresh spinach & added artichoke hearts and mushrooms. SO DELICIOUS. I made this recipe with a couple adjustments based off of what I had in the house and it was delicious! The adjustments I made were to use fresh spinach (from the garden) that I sauteed with the onion instead of frozen spinach, 1 brick of light plain cream cheese instead of the chive cream cheese, and dreamfields rotini pasta instead of rigatoni. I used leftover Costco rotisserie chicken that I cut up, and both kids (a 1 1/2 year old and a 4 1/2 year old) and my husband liked it, so it’s definitely a keeper! Caroline, I would think so though I’ve never done it myself. If you try it out, please let me know how it goes! Made this today but realized at the last moment I didn’t have the cream cheese so used laughing cow herb and garlic cheese and it was SO good. My husband and myself loved it so will make again and freeze in portions. I see no reason why it wouldn’t freeze well. The kids ages 11-13 thought it was so so but that’s nothing new. Thanks so much for the delicious and EASY recipe. Heather, I made this last night and it was BEYOND AWESOME! 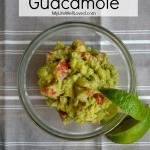 I absolutely love it when I can add new recipes to my regular rotation and this is definitely one of them! Oh, and I just sauteed’ the onions in the same pan that I seared/cooked my chicken breast in. – used 3/4 cup of savory ricotta cheese left over from stuffing squash blossoms. – used 2 cups shredded mozzarella cause who wants 1/2 cup left over when you can have a cheesier casserole? Can’t wait for it to come out of the oven! Hi Elaine! I’ve never tried it that way but I bet you could. If you try it, please let us all know, how it went! Can someone please let me know how i could cook this all at once in one pan. This looks very delicious, but the prep seems unnecessarily tedious. Do we really need to precook the noodles and chicken before the oven? 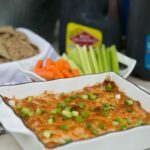 I love that you use the chive cream cheese, this looks delicious! Wow, this looks so creamy and cheesy no surprise it’s been pinned so many times! Would I need to change the recipe much if I use a 9×13 versus an 11×7 pan? Hey Avery, no, we have used both and you should be all good either way. 🙂 ENJOY! Yum!! This looks so yummy. A little trick I always use for shredded chicken is to throw it in my Kitchenaid Stand mixer with the hook attachment (instead of paddle) and turn it on for a couple minutes. 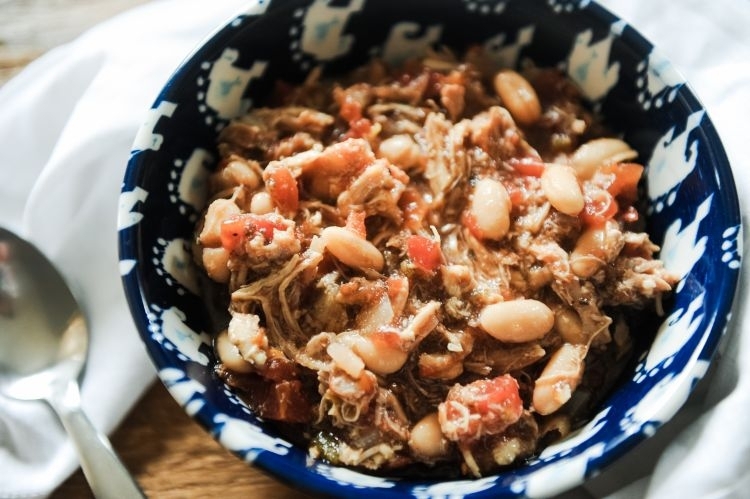 Shreds it all up perfectly without spending the time shredding it with two forks! ? 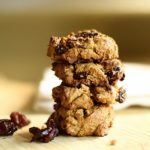 I’ve made this recipe in the past and we have LOVED it! However, I was just diagnosed with diabetes, so I’m wondering if you have any idea how many carbs are in a serving? I made this tonight it was delicious. I did substitute garlic and herb cream cheese.